The Gospels relate that our Lord appeared first of all to St. Mary Magdalene (cf. Mark 16:9), but there is a tradition among many saints and theologians that prior to this apparition, the good Jesus had appeared to his Mother Mary. Thus, the first clear witness to the tradition of a prior apparition comes from the 5th century poet Sedulius, about whom very little is known. The tradition is hardly apostolic, and does not seem to have been held with any great clarity or zeal until the early medieval period. However, from the medieval period forward, the saints and theologians are nearly unanimous in affirming a prior apparition to our Lady. Dom Prosper Gueranger cites numerous liturgical prayers and hymns (especially of the East) which affirm the tradition. An impressive number of saints hold the tradition: Including Sts. Anselm, Albert the Great, Ignatius Loyola, Teresa of Avila, and Blessed John Paul II. There is a nearly unanimous consensus among that faithful that Christ our Lord appeared first of all to his Mother and then to Mary Magdalene. But this wide acceptance does not seem to be much more ancient than St. Anselm (d. 1109). It seems that, once the tradition of a prior apparition to the Mother of God was proposed to the faithful, it was completely and universally accepted (or nearly so). While it is true that the tradition was not widely known or held in the early Church (or, at least, it does not seem that it was widely held); once the question was considered, nearly every member of the Church (from the popes to the lay faithful) thought it to be obvious that our Lord would have appeared first of all to Mary his Mother. We may conclude with the words of Blessed John Paul II, delivered on 21 May 1997: “From this silence [i.e. from the fact that the Gospels do not relate an apparition to the Blessed Virgin], one must not deduce that Christ, after his Resurrection, did not appear to Mary. […] On the contrary, it is legitimate to think that the Mother may really have been the first person to whom the risen Jesus appeared.” Still, the venerable pontiff has only stated that the tradition of an earlier apparition is possible, not that it must be believed by the faithful. St. Thomas Aquinas (who writes not merely with his own authority but also as a witness to the entire preceding tradition) very clearly does not think that there was any prior apparition to the Mother of God. Citing Mark 16:9, the Angelic Doctor claims that the first to see the risen Jesus was St. Mary Magdalene (cf. ST III, q.55, a.2, sed contra). Moreover, the earliest tradition of the Church presumes that Mary Magdalene was the first to see Christ after his Resurrection: “A woman was the beginner of transgression. A woman first tasted death, but in Magdalene woman first saw the resurrection” (Venerable Bede, d. 375; cited by Cornelius a’ Lapide on Mark 16:9). Likewise, the Easter sequence Victimae paschale laudes speaks not to the Mother, but to the Magdalene. The Catechism of the Catholic Church also seems to indicate that St. Mary Magdalene was the first to see the risen Christ: “Mary Magdalene and the holy women […] were the first to encounter the Risen One” (CCC 641). “Meanwhile, our Risen Jesus has been seen by no mortal eye; He has sped to His most Holy Mother. He is the Son of God; He is the vanquisher of Death; but He is, likewise, the Son of Mary. She stood near him to the last, uniting the sacrifice of her mother's heart with that He made upon the Cross: it is just, therefore, that she should be the first to partake of the joy of His Resurrection. “The Gospel does not relate the apparition thus made by Jesus to his Mother, whereas all the others are fully described. It is not difficult to assign the reason. The other apparitions were intended as proofs of the Resurrection; this to Mary was dictated by the tender love borne to her by her Son. Both nature and grace required that His first visit should be to such a Mother, and christian hearts dwell with delight on the meditation of the mystery. There was no need of its being mentioned in the Gospel; the Tradition of the Holy Fathers, beginning with St. Ambrose, bears sufficient testimony to it; and even had they been silent, our hearts would have told it us. Indeed, when we consider that Christ did not immediately appear to the Magdalene, but that he left her to weep for some time outside the tomb, one might reasonably ask: Where was the Lord during this time? The answer could well be, He was with his Mother. Ultimately, the intimate union between Mother and Son would incline us to think that our Lord would appear first of all to the Blessed Virgin. What else would a good son do, except visit and console his mother? The principle theological argument against a prior apparition to the Blessed Virgin is that Mary had no need of such a visit. The Mother of God had a firm and unshakable faith in the Resurrection, and this faith did not waver on that first Holy Saturday. Mary already knew and believed that her Son would rise, she had no need to see – Blessed are they that have not seen, and have believed (John 20:29). This would explain why the Mother was not present at the tomb: She already knew that he had risen. She did not know by sight, but by her unshakable faith. Of course Mary would not accompany the other women, she knew already that the body would no longer be there! Finally, considering whether it would be unfitting for Jesus to neglect to visit his Mother, we must answer that Mary did not have any need of such consolation. Although she was truly filled with grief, this sorrow need not indicate that she lacked faith in Christ’s Resurrection – indeed, the Lord himself was filled with sorrow, though he knew he would rise. Even if Christ did not visit Mary, we must admit that the two were most intimately united by grace – just as the Ascension of our Lord into heaven does not imply a separation, neither would Jesus’ physical separation from his Mother imply any neglect or division. The love which binds these two Hearts constitutes a far greater union than that which is produced by mere physical sight. What, then, is our conclusion? First, we must assert that either opinion is possible: A Catholic is free to hold either that Jesus did appear to his Mother first after the Resurrection or that he did not do so. Second, it would be extremely rash for any to claim (as many Protestants do) that the general tradition of the saints and theologians in favor of a prior apparition to the Mother of God is contrary to the Scriptures or that it is a mere product of human fancy. The near unanimity with which the tradition was accepted (once proposed) lends extremely strong support to the claim. Indeed, spiritual people have generally accepted the tradition – this has to count for as much as any theological argument. For my part – though, theologically and scripturally, I am inclined to think that Jesus did not appear first to his Mother – the overwhelming belief of the saints from at least the time of St. Anselm forward is enough to at least give me great pause. One thing is certain: The Blessed Virgin Mary enjoyed a most particular and exalted participation in the Resurrection of her divine Son. The audience address of Bl. John Paul II. An article discussing the tradition, with many helpful links. An article from Lay Witness Magazine. May God bless your writing and vocations and thank you for your service to the Church. Thank you for the specific reference to the Spiritual Exercise! Certainly, St. Ignatius of Loyola deserves special mention as (perhaps) the saint who has done the most to inspire this devotion in the Church. This is one of those questions that makes me think that, while Our Lady was the source for many of the passages of the NT, the Annunciation, Visitation, Nativity, etc, we might best see her gentle hand in what is not in Scripture. Might She not have said, "These passages and no others. Concentrate on My Son, not on me." In this way, the BVM would gently, with the inspiration of her Spouse the Holy Spirit, curb the natural inclination of the Gospel writers to include more about her. This is perhaps wild speculation but... Thank you for addressing a most compelling subject, Father. Dear Father. Splendid. God Bless you. That was so well-written and balanced and it truly warmed my heart. I love the idea of the symmetry of Mary giving Birth in a Cave and then being the first to receive confirmation that her Son had been reborn in a Cave. I'm copying and saving your piece. I would lean toward Our Lord not appearing at all to Mary, His mother, after His resurrection. As Reginaldus put it in the post, "Mary already knew and believed that her Son would rise, she had no need to see – Blessed are they that have not seen, and have believed (John 20:29)." The Resurrection was needed to confirm the faith of the Apostles, to instruct them in various matters, to confer the primacy on Peter. Our Lord didn't need to appear to His mother. She knew, trusted, and loved Him more than all the apostles combined. Let us also remember that one of the last things Jesus did before expiring on the cross was to give His mother to the care of St. John (see Jn 19:26-27). Of course, this is speculation, but why wouldn't He say this during one of His appearances after the resurrection? It even seems more fitting, to me at least, that He would do this immediately before His ascension. One final point. St. Paul considers to whom Jesus appeared. Mary is not listed. I have no problem with this, that like a good jewish son, he appeared to his mother. Perhaps an angel showed Mary a vision of the Risen Lord? I am with Dom Gueranger. It only makes sense that Our Lord would comes first to His Mother. No doubt, She firmly believed and knew that He would in fact rise from the dead. It doesn't matter that Our Lord didn't need to appear to His Mother. He loved Her and She meant the world to Him. And only in Heaven will we know what She suffered on His account. Eastern Catholics and Orthodox Christians answer with teh Ressurrectional Troparion in Tone 6, which is central to prayer and Divine Liturgy: "The Angelic Powers were around your tomb and the gurads became as dead,... then you dispolied Hades without being tried by it and you met the Virgin, o giver of life ..." Yes, Jesus met his mother. Fr. Reginaldus, maybe someday (God willing!)!! I look forward to meeting my friends in Heaven and hope that there is a period of "getting acquainted" with them before being engulfed in the Beatific Vision. While it is certainly true that the Eastern Rites contain numerous liturgical prayers which commemorate the Lord's visit to his Mother, we also have to be careful to examine the context of each text. For example ... the portion of the Resurrectional Troparion in Tone 6 which you cite does not seem to be decisive ... Mary Magdalene is called a "virgin" by St. Ambrose and there is an early tradition (I believe also in the East) that she was a virgin ... hence, whether the line "you met the Virgin" refers to the Virgin Mother or to the "virgin" Mary Magdalene is not entirely clear from the passage you have cited (neither does the capatalization of "Virgin" solve the question, since such capatalization is almost certainly not original). Am at a loss what purpose these argument would serve. Is the resurrection enhanced in anyway if it is believed that he first appeared to his mother? I am of the view that our God is more interested in all of us returning to Him, our first Love. These arguments may further create divisions in the body of Christ. Sam. I'm sorry that you see it that way ... the Catholic spiritual tradition has long asserted that it is very helpful to know certain specific details of Christ's life which are not expressed directly in the Gospels -- the idea is that it helps us to meditate better. Now, are you advocating that we stop praying the stations of the Cross? Personally, I believe that consideration of these themes -- though not strictly necessary to the faith -- can be a great aid in the spiritual life. Apparently Bl. John Paul II thought the same ... that is why he dedicated a Wednesday audience to the topic of whether or not Jesus appeared first to our Lady. Something that has always haunted me is wondering how Our Lady survived all those years separated from her Son, living with the experience, memories and horror of His crucifixion. This article seems to have provided me a new perspective. I had always subscribed to the idea that Jesus, of course, would have appeared to His Mother first, but it occurs to me, for very human reasons. Now, however, I wonder if He didn't actually need to appear to His Mother in His glorified state. What a delightful and fascinating thought that He may have made His presence known to Her, first, in a much greater, more gifted, mysterious and lasting way? Without attempting to provide an answer to this discussion, as I am writing 'on the fly', I would like to point out a couple of methodological aspects that could be improved. They focus on the use of arguments from Tradition against this possible apparition. First, the use of Mk cannot be considered overwhelming, since we must also consider 1 Cor 15, as quoted by dmw (etc.). Paul does not mention the apparition to Mary Magdalene either. Both passages must be taken in their context. Paul is making an ecclesially oriented argument. Mark is ostensibly talking about public apparitions. One should remember that the Evangelists, while obviously writing accounts of historical events, only include the aspects most pertinent for the theological point they are making, lest the world be filled to overflowing with books on what Jesus did and said. Scripture does not speak of the dormition of Mary, which is virtually impossible to argue against. Yet, the argument for her dormition and assumption remains unity with all aspects of the life and mystery of Christ. These arguments call, in those cases, for more than a spiritual unity. It would seem probable that similar consequences of this unity are found here. The second is the use of a sed contra from ST. This is a weak argument regarding Thomas' opinion (please take that technically, not argumentatively). Thomas does not tend to comment on sed contras in the ST. If this were a sed contra that he left uncommented in a QD, where he usually responds, it would be more valuable. Finally, remember that Thomas was wrong about the Immaculate Conception. His Marian theology is not his strong point, while Trinitarian theology, Christology, and Eucharist are. Finally, you are right that, for the moment, Catholics may hold either belief. However, I hope that the issue becomes ever clearer, as a clarity on this point similar to that we have for the dormition would be spectacular. Thank You for your work and reflections! Thank you father, it does give some food for thought! I'm inclined to side with the witness of scripture, the early fathers, and the Angelic Doctor, yet my great love for the Blessed Virgin pushes me to find a better explanation. I wonder if the Assumption could give a hint into this? Our Lady certainly had a 'exalted participation' in the Resurrection: for she would shortly have a share in the bodily resurrection, while the rest of the disciples, and ourselves, would have to wait much longer. So while the disciples had to see Christ glorified to be witnesses to His resurrection, Our Lady witness consisted in her participation and sharing in it. I don't even know if I'm making any sense! But I guess we're dealing with the 2 things that the scriptures seem to be deliberately hazy about: they speak little about Our Lady, and they certainly give confusing accounts of the resurrection: all underscoring the great mystery of these 2 subjects. I think you are both missing an important point ... it is not so much that the Scriptures are silent about an apparition to the Mother of God ... silence wouldn't lead to any conclusion at all. My point (as well as the point of the Catechism and the sed contra of St. Thomas) is that the Scriptures ARE NOT silent when it comes to the first apparition. Mark states: "He appeared FIRST to Mary Magdalen." I am not making an argument from silence ... I am making an argument from what appears to be a very clear statement. If your PhD is in theology, I am sure you well know that those who were holding to the Immaculate Conception were actually holding to it in a way that we would now consider heretical -- for they (namely, the Franciscans and others) argued that, by the Immaculate Conception, Mary did not need to be redeemed. Among those of his time, St. Thomas' belief is closer to the truth! Moreover, the dogma of the Immaculate Conception is largely founded on the principles which are established and developed by St. Thomas in his treatise on Mary -- ST III, qq.27-34. In any case ... the question of the first post-Resurrection apparition is not primarily point of Marialogy, but of Christology -- and, as you stated, Christology is the Angelic Doctors strong point. 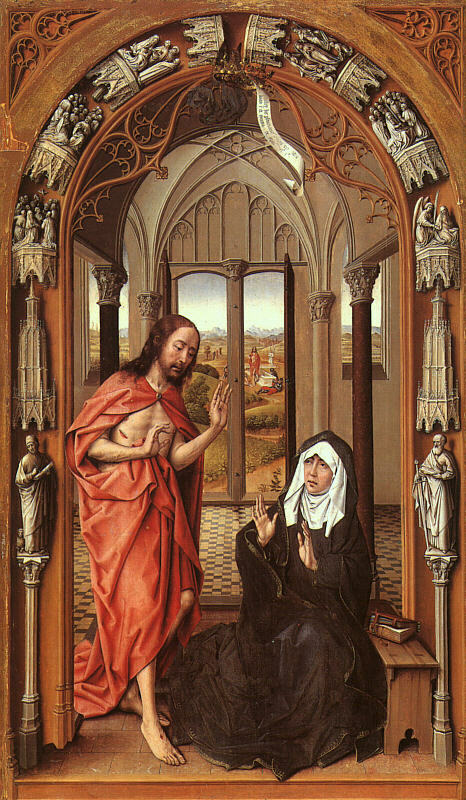 I haven't read all the comments in detail but it seems to me if Blessed Mother was intimately united with her Son in ways we will never understand, then she experienced His Resurrection in ways we will never understand; and probably not the way Mary Magdalen experienced it. I would simply like to repeat that I am not trying to resolve the issue. My point about Scripture is that it is not correct methodology to presume that something is a dogmatic statement or historically exclusive affirmation without an enormous level critical of demonstration, because the text is always highly complex and subtle, even when it appears simple. You could be right, but it is only an intuition at this point. However, in this mariological question, the Tradition of the Church, not only in her spiritual writers and many of her theologians, but also in her dogmatic proclamations, goes against this type of absolute reading here. Scripture does not stand alone, it must be interpreted within the whole Tradition, which regards in particular dogma and Papal teaching, such as that of John Paul II. My point about Thomas has been missed I feel. This is a sed contra. Thomas is not promoting his own opinion, and he does not return to this passage in the corpus or responses. Further, this was obviously not a burning question of his, and he was not at all attempting to deal with it in the article in question. I will just have to agree to disagree with you about the importance of his theology for Mariology. I love Thomas, and wrote my doctoral thesis on his Trinitarian theology, however, I think the history of dogma shows well enough that the major developments in Mariology, the most important of which were before Thomas, are not from his work. Finally, it is not totally accurate that those who promoted the concept of the Immaculate Conception at that time were stating that Mary was therefore not redeemed by Christ. This was not yet a specific aspect of the debate (perhaps one could find some author...). What was said, quite clearly, is that this was an act of grace, and this grace, as all grace, came through Christ the Head. CF Bonaventure, on this position he does not agree with: Fidei etiam christianae, ut dicit positio praedicta, non repugnat, pro eo quod dicunt, ipsam Virginem ab originali peccato liberatam per gratiam quae quidem pendebat et ortum habebat a fide et, capite Christo, sicut gratiae aliorum Sanctorum. Reginaldus in his May 4, 9.41AM post writes that “the question of the first post-Resurrection apparition is not primarily point of Marialogy, but of Christology”. Hence, let us examine the issue from Christ’s perspective. Jesus was a Jew who obeyed the Ten Commandments; the fourth being to honour your father and mother. Jesus would not have been honouring His mother, Mary, if He had appeared to anyone else before appearing to His mother. So it is difficult to believe that Jesus did not appear to Mary first. It would have been in keeping with Mary’s character not to mention this post-resurrection visit. Let me be extremely clear: I am not saying now, nor have I ever written previously, that Jesus did not appear first of all to his Blessed Mother. I have only written that there is room for multiple views when it comes to this belief -- Bl. John Paul II does not contradict this ... he only says that we "may" believe he appeared first of all to his Mother, not that we "must" believe it. brencel, your argument (that it would have been a sin for Christ not to appear first of all to his Mother) is way out of line. The "sed contra" is cited as the divine authority upon which the faith is based [the belief being that no one saw Christ rise because Mary Magdalene was the first to see him and she did not see him rise]. However, you are quite right (and I should have said this more clearly before) that St. Thomas does not return to the point. Indeed, it is not so much that St. Thomas Aquinas denies that Jesus appeared first of all to his Mother -- he only presumes (following the most natural reading of the Scriptures) that Jesus "appeared first to Mary Magdalen". Like the early Fathers, the question of whether Jesus appeared first to his Mother does not seem to have even entered the mind of the Angelic Doctor ... it was simply presumed that the Lord appeared first to Mary Magdalene. Hence, as you stated, I should not present St. Thomas as though he is opposed to the pious belief, but only as one whose general thought on the subject would preclude the devotion. Regarding the interpretation of Mark 16:9 "He appeared first to Mary Magdelen" ... I would never intend to interpret this one passage apart from the Tradition or the magisterium ... hence I look to CCC 641, "Mary Magdalene and the holy women [...] were the first to encounter the Risen One." Now, Bl. John Paul II apparently did not see it that way ... and so we are certainly free to think either way on the issue. But it is simply not accurate to present me as taking a single passage of the Bible out of context and interpreting it separate from the magisterium and the Tradition. It is the month of May dedicated to Our Lady. Why don't we just ask Her ourselves? Maybe She will tell us. Which of the 7 sacraments are we discussing? You should be confused, Reginaldus, as I meant commandment not sacrament. Sorry for the confusion! Now I understand ... my point about the "pious devotion" refers not to the question of WHETHER Jesus would honor his Mother Mary, but HOW Jesus would honor her. To me, it seems entirely plausible that he would honor her through an interior illumination of divine grace -- such that not appearing to her is a testament to the whole world that she is the Woman who alone maintained the faith on Holy Saturday. On the other hand, it is also possible that he honored his Mother by appearing first of all to her. As far as the Church is concerned, either pious belief is acceptable. This may sound irrational - much of what I think and write is - but I fancy a symmetry in which The Theotokos is the first to see Him at The Incarnation in a Cave and the first to see Him after The Resurrection in a Cave and Dom Gueranger, in entry after entry, insists that Jesus appeared to His Mother first. But, I do respect the way you laid-out the issue and I appreciate your open-mindedness. "This may sound irrational - much of what I think and write is - but I fancy a symmetry in which The Theotokos is the first to see Him at The Incarnation in a Cave and the first to see Him after The Resurrection in a Cave and Dom Gueranger, in entry after entry, insists that Jesus appeared to His Mother first. At least this ain't a Molinism-Thomism moment :) "
Dom Gueranger, "The Liturgical Year," has another example of Jesus appearing first to Mary. "...Jesus triumphs; he appears to them that love him, to Mary first..."
Are you sure that this sequence of St. Gall refers to Mary the Mother of God rather than to Mary the Magdalen? I don't know one way or the other ... I am only saying that the passage you have quoted does not seem decisive. Dear Father. I am still searching for it on google. Because the Saint-to-be has multiple references to Jesus appearing first to Mary in his entries at Paschal time, I just assumed ti referred to His Mother, Mary. ""Et victor suis apparens dilectoribus vivens, Primo Mariae..."
Perhaps this is not worth the mention but I think we are discussing Mark 16:9...not Mark 9:16...for what it is worth! Anyway without a lot of further blather...who but one unfamiliar with the nature of Jewish moms and their sons would believe for one second Jesus would not deliver, in Person, the Good News first to His mother. End of discussion!! I am probably the most nonentity, or one among them, when it comes to blogging and argumrentation. But somewhat similar to 'I am not Spartacus', I do have thoughts about certain scriptural matters that at the time I was thinking of such, I did not have specific knowledge nor did I do any prior research on it. All I did was ponder about it. But by God's grace, it would turn out later that my thought is not heretical or contrary to the Church teaching, because I always pray not to entertain any thought contrary to the teachings of our Holy Mother Church. One of this was the nature and truth of our Lord's Resurrection [which, thanks to you, you've already covered in another article, http://newtheologicalmovement.blogspot.com/2011/04/lazarus-resuscitation-compared-to-jesus.html]. Although I was approaching it from a different perspective: The question I was reflecting on was, "If Jesus was resurrected and appeared to His apostles and disciples, why was he not being tempted and annoyed by Satan and the evil spirits anymore?" And at that time, I wasn't familiar with the glorified essense of His being. Then, I also pondered on the scientific nature of his passing through the closed door: Did the molecules of His Body kind of interspersed with those of the door and other earthly materials? It was only later, after I read about our Lord's Resurrection in the Mystical City of God of Sr. Mary of Agreda that I began to be more enlightened about His glorified nature, and among other things, glorified body - His or the elects in the future - can occupy the same space as those of earthly entity. Furthermore, the then Cardinal J. Ratzinger's 'The Truth of the Resurrection' [http://www.ignatiusinsight.com/features2007/ratzinger_resurrectionitc_mar07.asp] from his book, Introduction to Christianity, and more recently, the entire Chapter Nine of our Pope's Jesus of Nazareth, Part 2, [pages 241-277] have enriched my understanding of the Resurrection. The reason why I'm bringing this up is because when I came across the subject about our Blessed Mother as being favored to be the first witness of His Resurrection also in the same book, Mystical City of God, there was an instinctive assent of my intellect, notwithstanding the fact that Sr. Mary of Agreda's City of God took al least 10 years before it was equitably and gradually accepted by many in the Catholic circles. In contrast to this, even though I'm a convert to the Catholic Church, I never entertained any merit of the Protestant's 'Rapture'. To date, I could not understand why non-Catholics [and unfortunately even the usual theologically onion-skinned 'Catholics'] would even come up with such distorted belief. So, to recap, I am one of those who are convinced that the 'logic of the faith' seems to support that our Lord favored our Blessed Mother to be the first witness of His Resurrection. After all, Saint John said that there are many things that our Lord did and are not in the Bible. Note about the related issue: I am still interested in finding your reflection about what the devil and his cohorts were doing as our Lord appeared to His apostles. Did he [the devil] sense anything or was he completely made blind by our glorified Christ. In the same venue, did the angelic intellect of the devil allowed him to sense the apparation of our Blessed Mother to the 3 children of Fatima and other visionaries? I noticed in your opening paragraph you mentioned there were private revelations that confirmed this. I was wondering if you remember some of the saints who had these revelations and where I could find some information on it.